One of the advantages to living in a metropolitan area is the access to good zoos. Covering 122 acres, and featuring over 950 animals representing 230 species, The Birmingham Zoo does not disappoint. Opening its doors on April 2, 1955, as the Jimmy Morgan Zoo, Monkey Island was the first zoo’s first exhibit. During the Zoo’s first 30 years, its name changed to The Birmingham Zoo, as it grew to be both world-class and fully accredited. However, the City of Birmingham, despite having one of the highest tax rates in the country, was unable to maintain the budget necessary to sustain professional operations at the Zoo, and it lost its accreditation in the late 1990s. Mayor Richard Arrington pushed for the privatization of the zoo in 1999 and Birmingham Zoo, Inc., a not for profit corporation, was formed to create a public-private partnership. In 2001, a major capital campaign was launched in support of the Zoo. With increased funding and new leadership, the Zoo soon regained its accreditation through the Association of Zoos and Aquariums, which ranked our Zoo in the top 10% in the nation. But enough about the Zoo’s history. Let’s get to the animals! After making our way through the entrance, we start on the left and tour the Zoo counter-clockwise. You will find a map here if you wish to follow along. The first set of buildings that you encounter is a part of the older main Zoo. 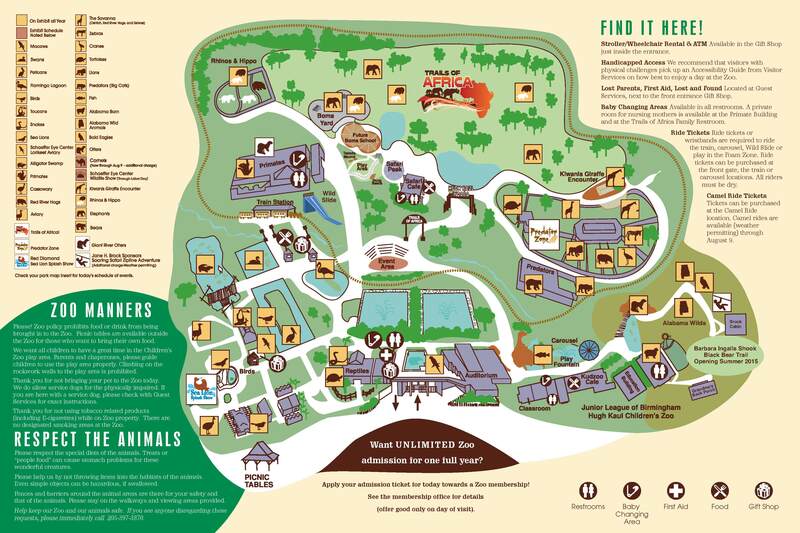 Here you find the Reptile Building, Bird Aviaries, Tortoise Yard, Kangaroo Kountry, Alligator Swamp, Macaw Plaza, and Flamingo Lagoon. Many of these exhibits are air-conditioned, which make them great for escaping the summer heat and humidity. Anchoring this section of the Zoo is the Red Diamond Sea Lion Splash Show, which opened in 2007. The sea lions perform several times each day in a very entertaining and interactive show. In addition, the Schaeffer Eye Center Lorikeet Interactive Feeding and Observation Aviary is a lot of fun. Continuing on, you find yourself at The Birmingham Zoo’s signature attraction called Trails of Africa. It opened in 2011, and this section of the Zoo features a mixed-species exhibit that includes an all-male herd of African elephants, rhinos, hippos, and giraffes. Be sure to schedule some time to feed a giraffe by hand at the Kiwanis Giraffe Encounter. Moving past the Trails of Africa, you return to the older main Zoo and enter the Predator Zone, where you will find lions and tigers and bears! Oh, my! Your final stop is at the Junior League of Birmingham – Hugh Kaul Children’s Zoo. Completed in 2005 at a cost of $15 million, this area features an Alabama Stream and Wild section, an Alabama barn with equestrians that love petting, Grandma’s Back Porch, Granny’s Butterfly House, and a domestic animal petting zoo. Also in this area is the Jane H. Brock Soaring Safari Zipline Adventure, to be enjoyed by the young at heart for an additional fee. Beginning this coming weekend, a brand new exhibit will open in the Alabama Wilds area called the Barbara Ingalls Shook Black Bear Trail. This exhibit will feature two rescued North American black bears named Bety and Sassy. I am definitely looking forward to meeting them. Please visit the Birmingham Zoo to take a walk on the wild side. You can find operating hours and other information by clicking here. Please leave questions and comments in the comment section below.